It’s December 2002, and Oscar season is getting underway. On Dec. 9, Martin Scorsese’s Civil War period piece, “Gangs of New York,” premieres in New York. It stars Leonardo DiCaprio, Cameron Diaz and Daniel Day-Lewis, with John C. Reilly in a supporting role. A day later, Rob Marshall’s musical about fame and crime in the roaring 1920s, “Chicago,” premieres in Los Angeles. Renee Zellweger, Catherine Zeta-Jones and Richard Gere headline, with John C. Reilly in a supporting role. And five days after that, on Dec. 15, Stephen Daldry’s era-spanning film about the effect of the novel “Mrs. Dalloway” on three generations of women, “The Hours,” premieres in New York. It stars Nicole Kidman, Meryl Streep and Julianne Moore, with (naturally) John C. Reilly in a supporting role. Looking at credited roles,3 there have been only 13 people who were in three best picture nominees in a single year. Of those 13, 11 came during the Golden Age of Hollywood — and in those years, between 10 and 12 films were nominated for best picture each year. Only two of the 13 people, Claudette Colbert and Jessie Ralph, were women — more on this in a moment. This, if anything, underscores how truly outstanding John C. Reilly’s performance in 2003 was — and, to a lesser extent, Stuhlbarg’s in 2017. In 2003, when Reilly scored his trifecta, there were only five best picture nominees. But the academy again expanded the potential pool of nominees in that category to as many as 10 in 2009; Stuhlbarg appeared in three of nine this year. Just how prestigious is the John C. Reilly Award? For comparison, more people (23) have won an Oscar, an Emmy and a Tony — the Triple Crown of Acting. Twelve people have EGOT-ed (won an Emmy, Grammy, Oscar and Tony). Of course, the John C. Reilly Award honors a single year of excellence, but what if we expand our time horizon? Let’s look at the “Lifetime John C. Reilly Award” — who’s appeared in the most best picture nominees over the course of their entire career? Jack Nicholson remains the undisputed champion here with 10 appearances. 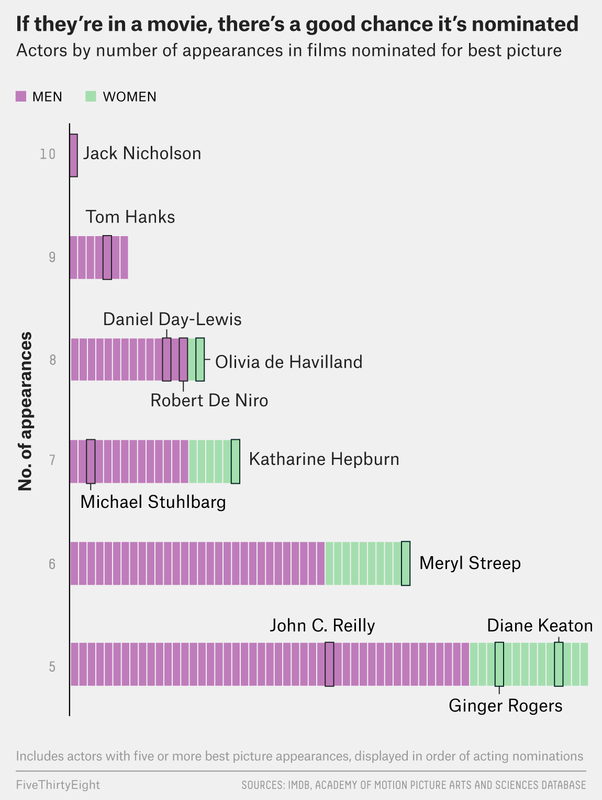 But there are people not far behind Nicholson who could still add to their total: Tom Hanks, Daniel Day-Lewis and Robert De Niro. Day-Lewis is allegedly retiring from acting, and De Niro no longer makes good movies, so Nicholson’s eventual usurper might be Hanks. “What you found does not surprise me,” Harris told me. “It confirms my sense of what the underlying issue is in the Oscars and in the industry. Seeing this imbalance, I wanted to compare a given individual’s best picture resume with the number of times that person was nominated for an acting Oscar.6 Given that composer John Williams has the most Oscar nominations of any living person and John C. Reilly inspired this study, I’m calling this metric “Williams Above Reilly,” or WAR, which will never be confused with any other existing advanced metric. A high WAR means an actor was recognized for individual performances far more often than the films that actor was in. A low WAR means an actor has been in a lot of highly regarded films but hasn’t received much individual credit. And a WAR near 0 means those two things are balanced. Williams Above Reilly (WAR) is found by subtracting the number of an actor’s best picture appearances from the number of acting nominations, then dividing that by the total of both categories. Interesting people with high WAR values include Denzel Washington, Susan Sarandon, Julia Roberts and Streep. Some standouts with low WARs include John Cazale, Harrison Ford, Hugo Weaving, Brad Pitt and our man Stuhlbarg. The middle area — the balanced performers — is eclectic but interesting, with character actors like Robert Duvall, Kathy Bates, Woody Harrelson, Octavia Spencer, Cate Blanchett and Marlon Brando popping out. And there’s John C. Reilly, with one of the lowest WARs in the bunch — half of it derived from three films that all premiered in one seven-day span in 2002. A bunch of people have been credited in two best picture nominees in one year. The cast data used in this article comes from IMDb. The best picture and acting award data comes from the Academy of Motion Picture Arts and Sciences database. An overly inclusive definition of “appeared in the film,” which counts uncredited appearances, says 79 people have appeared in three or more best picture nominees in a single year since the Academy Awards began. Of these 79 people, 73 pulled the feat off sometime from 1930 through 1951 — the approximate boundaries of the Golden Age of Hollywood. More importantly, that’s also a period in Hollywood history when the studio system, where individual performers had contracts owned by studios and had their roles dictated to them, reigned supreme. This is where the inclusive definition fails us. Looking at some of the people who appeared, uncredited, in five best picture nominees — perennial waiter Gino Corrado in 1941, then-crowd-filler Dennis O’Keefe in 1937 and menacing tough Harry Cording in 1936 — it’s clear we’ve got to be more selective. So we’re looking only at credited parts. Of the 145 people who appeared in five or more best picture nominees, only 32 were women. A span that saw Streep receive 14 acting nominations. Only the real deal — none of this “honorary” crap.